* Generic templates. These are 26 spreadsheet programs written in Microsoft Excel, readily adaptable by you for hands-on experimentation and learning. * Questions and Answers. The "Questions" document has chapter-by-chapter questions to accompany the text, while the "Questions and Answers" document has the questions plus their answers. * Supplemental readings. For select chapters, supplemental readings are provided, such as "Smith vs. Van Gorkom.pdf," "Survey of Key Court Cases.pdf," "Documents for Filing with the SEC.pdf," "Lecture: The First Round Documents.pdf," "Lecture: The Definitive Agreement.pdf," and "Lecture: The Merger Proxy Statement-How to Read It and What It Reveals.pdf." * Crystal Ball simulation add-in software. This is useful for valuing real options as discussed in Chapters 14, 16, 22, and 23. * Key Spreadsheets from the Questions and Answers. These include 11 spreadsheets that show you derived solutions from the Questions and Answers, provided here to enable students to study the underlying Excel functions and formulae. These hidden functions and formulae can be useful to readers who ultimately wish to develop their own spreadsheets. * Key Spreadsheets from the Workbook. These are 16 spreadsheets from the Applied Mergers and Acquisitions Workbook (to be purchased separately), provided here to enable students to study the underlying Excel functions and formulae. These hidden functions and formulae can be useful to readers who ultimately wish to develop their own spreadsheets. Robert F. Bruner is the Dean of the Darden Graduate School of Business Administration and Charles C. Abbott Professor of Business Administration at the University of Virginia. 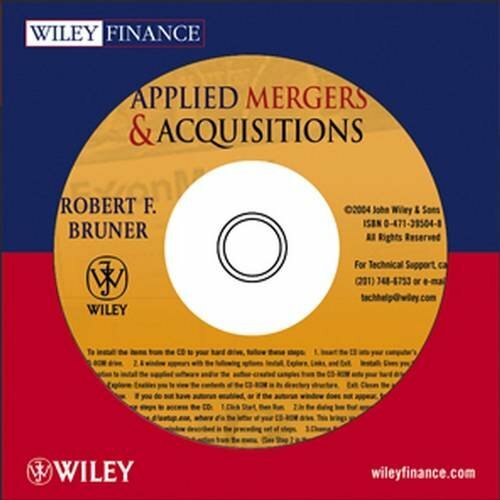 He is the author or coauthor of more than 400 case studies and notes as well as the author of two other Wiley titles, Applied Mergers and Acquisitions and Deals from Hell. Bruner specializes in the areas of corporate finance, mergers and acquisitions, and investing in emerging markets. Bruner holds a BA from Yale University and an MBA and DBA from Harvard University. Sean D. Carr is the Director of Corporate Innovation Programs at the Darden School's Batten Institute, University of Virginia. His applied research in new ventures and corporate finance has been published in numerous award-winning case studies, books, and digital media. Previously, Carr spent a decade as a journalist, having served as a producer for both CNN and ABC News's World News Tonight with Peter Jennings. He holds a BA from Northwestern University, an MS from Columbia University, and an MBA from the University of Virginia.